The Midnight Review: Rally To Restore Sanity Twice As Big As Glenn Beck's Rally! 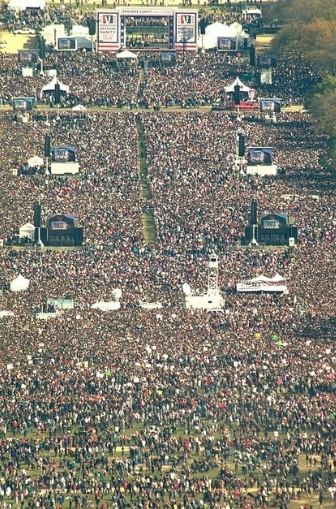 Rally To Restore Sanity Twice As Big As Glenn Beck's Rally! The Rally to Restore Sanity is over. I had wanted to attend but could not on such short notice. I was worried that not many people would be able to attend and Glenn Beck - or conservatives in general - would use the poor turnout as a reason to push their agenda even harder, but it appears I did not need to worry - the Rally to Restore Sanity beat out Glenn Beck's rally with a turn out more then two times the size! According to CBS News, 215,000 people showed up for the rally on Saturday. By comparison, CBS estimated that 87,000 -- just 40% of the Sanity Rally estimation -- attended Glenn Beck's "Restoring Honor" rally in August. Canada's CTV, meanwhile, wrote that 250,000 people were estimated to have partaken in the Rally to Restore Sanity. Earlier on Saturday, Brian Stelter tweeted that the Parks Service approximated that "well over 200,000" attended Saturday's rally. I find this amazing, considering Beck promoted his rally for months. I also find the comparisons between the two rallies because of the feud between Glenn Beck and John Stewart. Also, think of it this way - the right-wing felt the media underestimated Beck's rally, so they gave estimates upwards to one million, so just imagine what that would mean for Stewart and Colbert's rally! Here is an interesting observation - Andrew Breitbart's Big Government was void of any post regarding the Rally to Restore Sanity and Glenn Beck's The Blaze had a short review of the rally, insisting most of the rally were young pot-smoking white kids who didn't know why they were there. Basically, conservative media tried to underplay Stewart's more successful rally - some commenters scoffed at the idea that Yesterday's rally had atleast 150,000 people and claimed Beck's August rally had four times that amount. What is really ironic is many of their comments allege that the attendees live with their parents. They do not realize their hero, Jimmy "The love boat" O'Keefe was living with his parents when he entered a federal building under false pretenses. Excellent point. I thought The Blaze's comments articles were funnier then the rest - they seem so comedic and extremely amateurish. I couldn't believe that The Blaze actually insinuated that the rally got a big boost from students who could attend the rally just by walking from their dorms. I also noticed that most arguments based everything off of assumptions (as usual). They assumed the attendants were students, or liberals, or pot-smokers, or non-political. Like Beck's rally, there was this claim to non-partisanship, and Stewart's rally was much more so then Beck's, but I get the impression that the left adopted this rally as their response to Beck's, and it appears it was much more successful. This 72-year-old (not living with my parents yet!) went to the rally to keep the story from being about how few attended. There were people of all ages standing in my general area, including families with children. The event had neither the feel of a political rally nor of a celebrity event. I was a little disappointed at first at how little coverage it received and how little significance was attributed to it, but I guess that merely proved the point that the press is failing to meet its obligations to the citizenry. No worries. Let's all, of whatever political persuasion, keep showing up. I wish I could have gone but unfortunately I had to work. The rally looked to be a nice, very civil gathering. I found coverage of the rally to be disheartening - the "liberal" media praised the event while the right-wing propaganda machines downplayed the event, while the mainstream media seemed to be convinced that the rally wasn't anything special and was not some sort of call-to-action for Democrats to go out and vote. While it was "non-political," I believe this was very much so a Democratic/moderate/centrist rally aimed to dispel the belief that the tea party represent the majority, and considering the turnout, I think the point was made. I had heard comments made that the rally was to combat radicals from the left and the right but I fail to see instances of radicalism from the left, or at least large instances requiring a DC rally - now conservatives on the other hand need a push back. I'm a Republican but I believe the GOP has gone too far by embracing the fringe - if the GOP would come to the table and work together, the state of America would be better off, but because they have dragged their feet kicking and screaming, they have made things difficult, diluting legislation that they later call to repeal - that is not change I can believe in!